When I’m not busy mixing fruit and meat into bizarre combinations I am lucky enough to be a primary school teacher. Many of the children I teach are from Japanese backgrounds, so I often see these delightful little triangular mounds of rice in their lunchboxes. I was amazed at how perfect they look, and being a lover of Japanese foods in restaurants I became curious about these creations. My understanding is that these are typically stuffed with various fillings, but for this attempt I tried something a bit different and worked the filling through the rice. It’s worth saying here, I never make claims to pure authenticity in my recipes – just make them taste good. Here, the prawn’s sweet-salty flavour delicately kisses the pineapple’s sweet-sour tones to make a lovely little snack. All of the ingredients here are available at most large supermarkets, but you may need to be pointed in the right direction. Prepared Japanese Rice – instructions here. Follow up until step 4. Ripe Pineapple – a few rings goes a long way. Finely mince the prawn and pineapple in a food processor, or with finely chop with a knife. Mix thoroughly with the prepared rice and season liberally with soy sauce. Taste and adjust to your liking and add chilli flakes to your own liking. I just like a little kick. Spread out on a large plate or tray for it to cool down – this will be essential for the shaping process, as it needs to be nice a sticky. To shape, wet your hands with a little water and sprinkle with salt. Take a handful and shape into whatever form you like – cones, triangles, rounds are all fine. Add a little strip of nori along the bottom. Sprinkle with sesame seeds for a nice bit of visual contrast on the yellow surface. Wrap in cling film and eat cold. Posted in Fish, Guesscipes, Mains, Sides and SnacksTagged asian, food, guesscipe, Header, onigiri, pineapple. 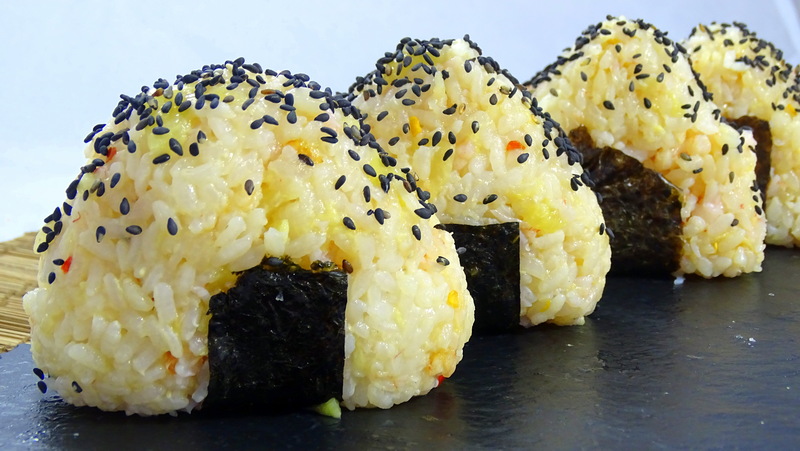 chilli, prawn, recipe, Rice, sesame seed, spicy, sushiBookmark the permalink.